LOOK AND SEE HOW EASY fermentation CAN BE! The Craft Automation Advanced Cellar Control System is an advanced yet easy-to-use technology designed to bring craft-centered automation to the micro beer, distilling, and wine industry. Designed with the economical brewer in mind, the system's vast array of functionality keeps your business doing more of the creative with less of the mundane. With advanced features like mobile control, email notifications, customizable zone control, automated scheduling and fermentation recipe control, the Advanced Cellar Control System is an absolute necessity in producing the quality and consistency you and your customers demand. Have any potential expansion plans in your future? Our system is easily expandable for the continued growth of your cellar. Subsequently, if you're looking to control more of your process, ask us about the potential for integrating your Cellar and Brewhouse Controls into one easy to use system! *Each Craft Automation system is custom engineered to exceed the requirements of our customer’s process. With our technology, the possibilities of your control abilities are entirely up to your imagination. Let us know how we can help improve your process through our automation solutions! Complete system control and monitoring at your fingertips! The 12.1" full color, bold touchscreen user interface allows you an overview of the Cellar Control system. Showcase your brewery logo on the home screen. Control and monitor your process remotely through any network connected tablet, computer, phone, or other browser-enabled mobile devices. Imagine the possibilities of being in complete control of your process without being tied down to the cellar! Monitor each tank within your cellar individually. Easy to read tank status and settings for automated temperature scheduling offers the capability to maintain up to 60 zones of temperature control. Whether it is multiple zones per tank or just a single solenoid, engineering the system to your exact requirements is easily possible. 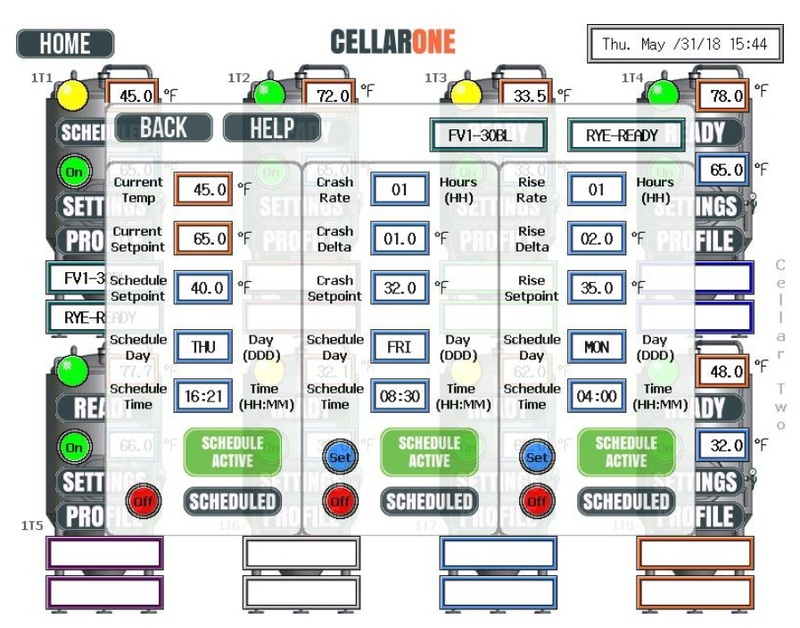 The Cellar Control System also integrates user customizable tank tags into every cellar vessel. With this feature, you can label critical inventory information, communicate tank prep conditions, or even leave notes for the night shift. The Craft Cellar Control System also offers functionality to schedule cellar temperature setpoints automatically. Just enter the desired temperature with the date and time of the change and the software does the rest. Access from any device within the network allows you the ease of scheduling remotely. Plus we’ll send an email notification of any changes. Planning to package early in the morning? No problem! Schedule the tank to be ready when you need it! Do you need to go beyond just scheduling temperature changes? Utilize the fermentation recipe scheduling feature! Input multi-stage commands to hold set temperatures of different parts of the fermentation vessels at their setpoint. A stage timer advances through the recipe or manually advance or turn stages on/off. Click here to check out a full overview of the Recipe Touchscreens! Configure email alert notifications for Power Loss, OverTemp, UnderTemp, and Chiller Failure. Wonder what went wrong? Look to the Alarm Log for a detailed summary of faults and times. Still can't figure it out? Contact the nerdy techs at Craft Automation who are always happy to help! We’ll continuously keep you informed of any temperature alerts or setpoint modifications through email and text notifications. Have peace of mind knowing our system is there to protect your product and alert you in the event of any trouble. Our easy to read chart logs single temperature inputs per zone for graphical data tracking and monitoring. We Can Use Your Current Temp Sensor Setup! The Craft Cellar Control System is specifically designed to save you time and money by integrating your existing NTC, RTD, thermocouple, or analog temperature sensors directly into our programmable logic controls. Other automation solutions force you to purchase their sensors, costing you up to an additional $250 a tank and the hefty cost of installation. With the Craft System, you can easily plug and play by moving your current sensor wiring over to our panel. 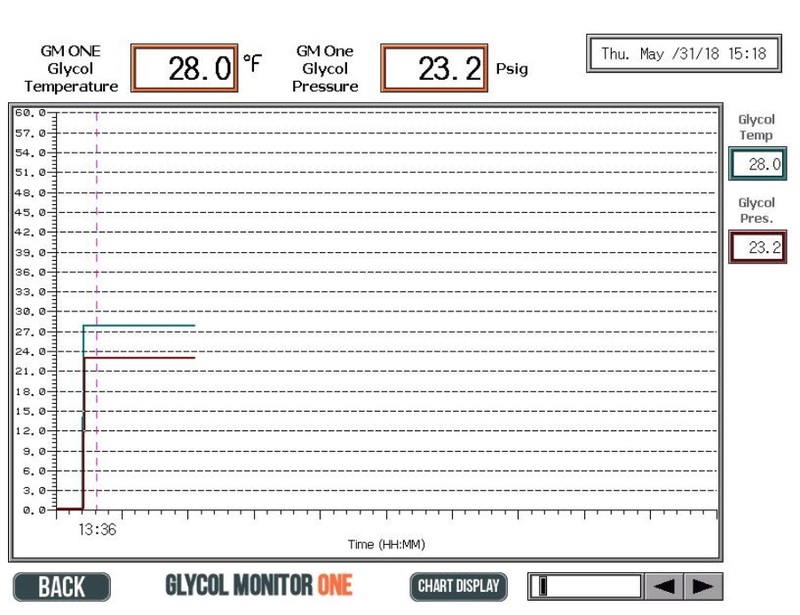 Our creative glycol monitoring option continuously observes and logs your chiller's temperature and pump pressure to keep your vessels within spec. Any fluctuation out of a user-defined range instantaneously produces an alarm and email/text alert notification to let your staff know there is a problem. In addition, our innovative "Glycol Hold" technology automatically shuts down any open loops requiring cooling below the current temperature, effectively eliminating any additional failures due to tanks becoming heated from bad glycol. Looking to monitor the head pressure in your tank to prepare your product for optimal packaging? Craft's Pressure Monitoring option includes hardware to monitor the vessel pressure. Set high- and low-pressure specs and we'll provide email alert when out-of-spec pressure levels occur. Craft Automation offers a solution to keep you connected through any situation, even a facility wide power failure. Our battery backup option allows the FVCT Cellar Control System to instantly send you a power loss notification and continue monitoring your cellar for any temperature alerts. Don’t worry! Our cellar management system is specifically designed to be an easy drop in installation for any setup. We’ll tailor your system to incorporate what you already have in an effort to keep cost and labor low.